Dog walking not only gives you quality time with your pet and a chance to get some fresh air, it also allows you and your pet to make new friends in the process. In fact, it has been reported that 46 percent of dog owners surveyed confirmed that dog walking was the most effective way of making new friends, with 29 percent making friends for life. There are also benefits for your dog when out for a walk, as allowing them to mingle with other dogs allows our pets to really let themselves go. This will mean that there is less rough behaviour at home as the dog tries to entice you to play, as they would have already tired themselves out with an enjoyable playtime earlier in the day. These benefits alone are enough for you to fully embrace dog walking. But it’s even better when we get a chance to contribute to a worthwhile cause whilst spending quality time with our pet. And here’s our chance: the upcoming K9:9k charity dog walk taking place on Sunday 18th February. The walk is in aid of Sunflowers, a charity based in Aigburth that has supported cancer sufferers and their loved ones for the last thirty years through counselling, therapies, arts and crafts and a series of other activities within a warm and welcoming environment in the Merseyside area. The charity is independent, so it relies on fundraisers and donations to carry on the tremendous work changing the lives of those affected by cancer by offering therapeutic activities and counselling. The event will tie in with the Chinese New Year, which is aptly the Year of the Dog. The dog walk begins at 10am at Constellations in the Baltic Triangle, continuing through Brunswick down to the Liverpool promenade. Along the way you’ll have surprises and entertainment, get the chance to meet your postie, and arrive back at Sunflowers on Aigburth Road where your dog can get a doggy massage and doggy bag to take home. 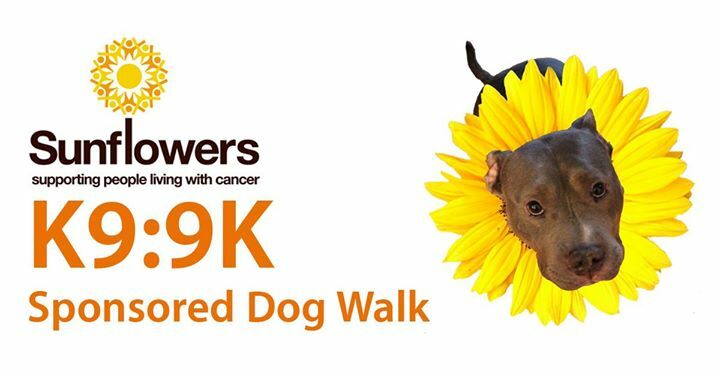 Not only is the K9:9K charity dog walk a great day out for you and your dog, but it’s also a great way to meet like-minded people keen to make a difference and make new friends. Even if you don’t own a dog, you can still take part in the event. It promises to be a great community occasion as well as allowing you to make a difference locally. Tails in the City staff and clients are taking part – will you join us? Let us know on Facebook or twitter if you’re coming down so we can look out for you!